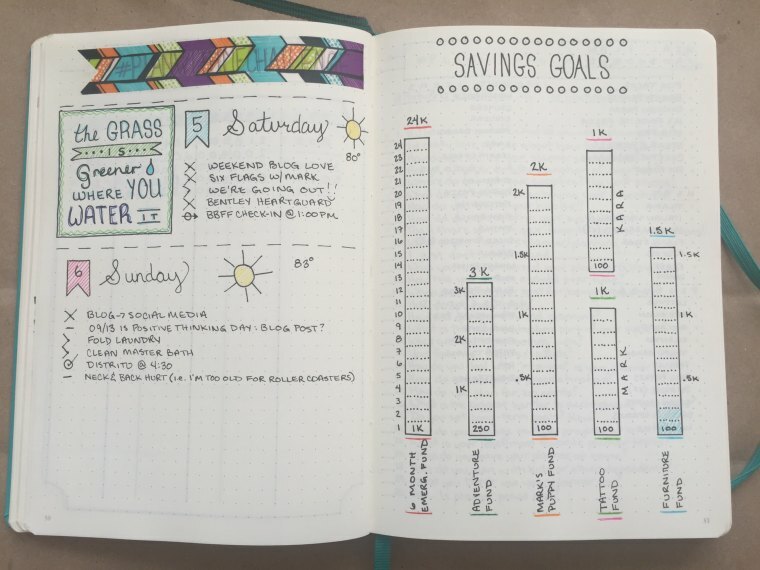 Bullet journals offer a beautiful way to track our progress, health, eating habits and exercising goals. They truly let us stay on top of things. 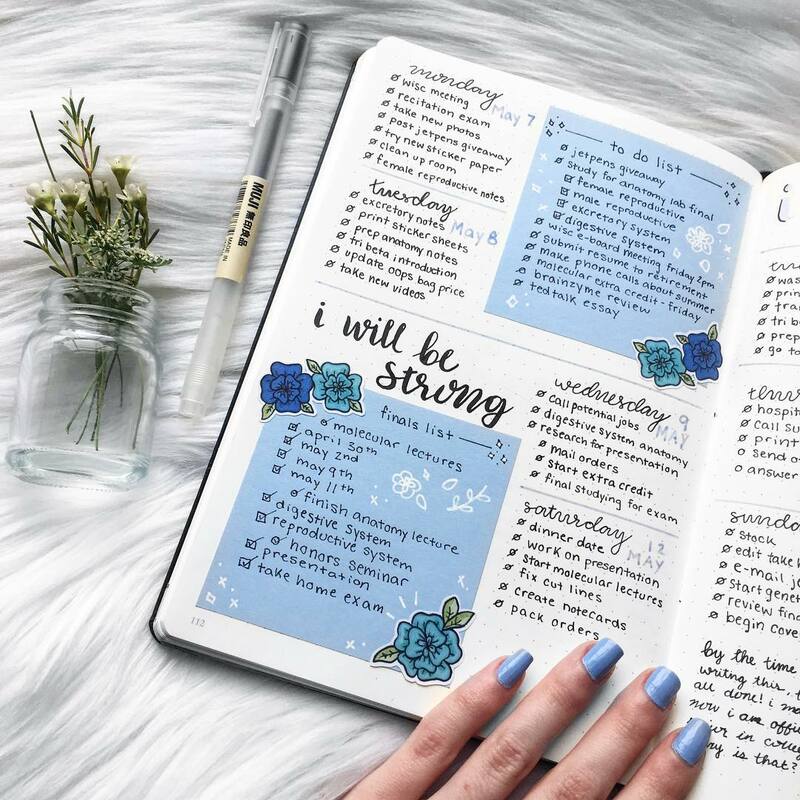 If you love to feel in control of things and want to stay more organized, you have to start a bullet journal! Trust me, your life will forever change! 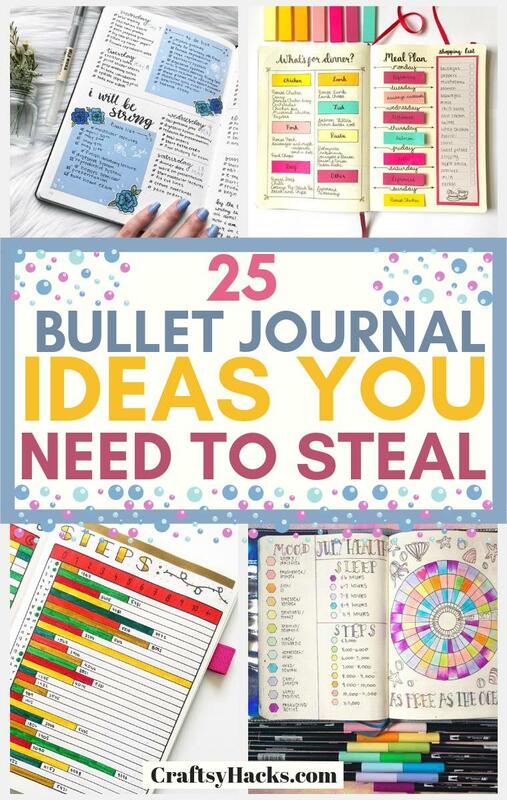 Today I’m sharing a few bullet journal ideas that will help you to get started! 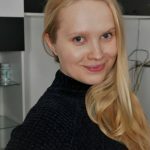 If you lack inspiration or want to transform your journal, see these original ideas I’ve found! Try them and track your achievements. 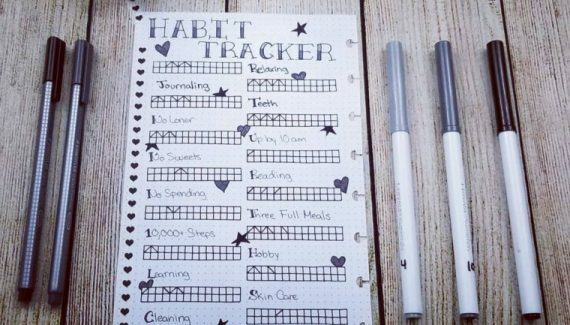 Feel like it’s time to track what you’re eating and change your diet habits a little bit? 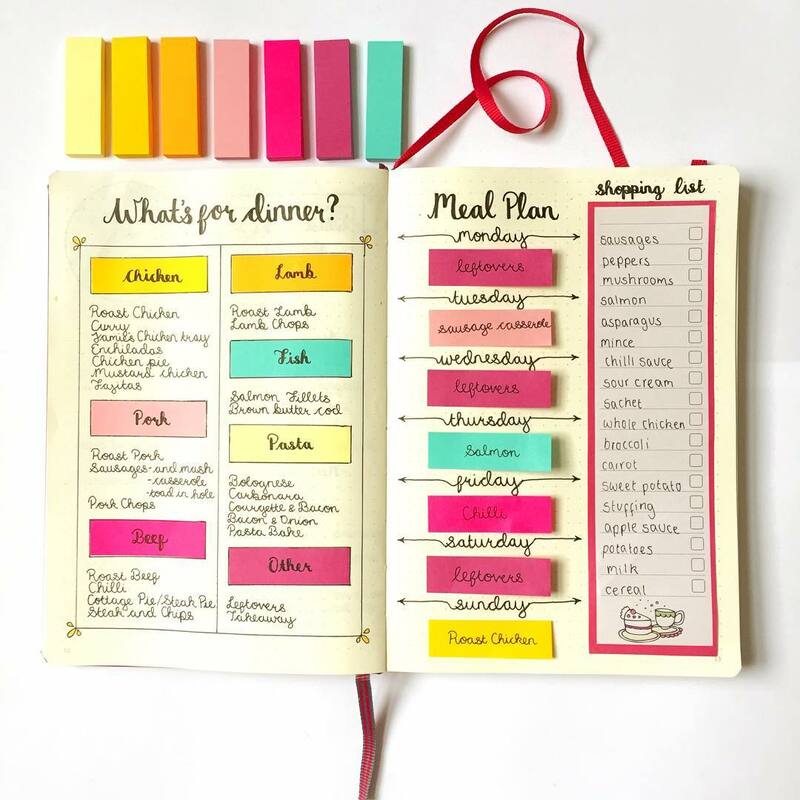 This little meal planner will do just that. 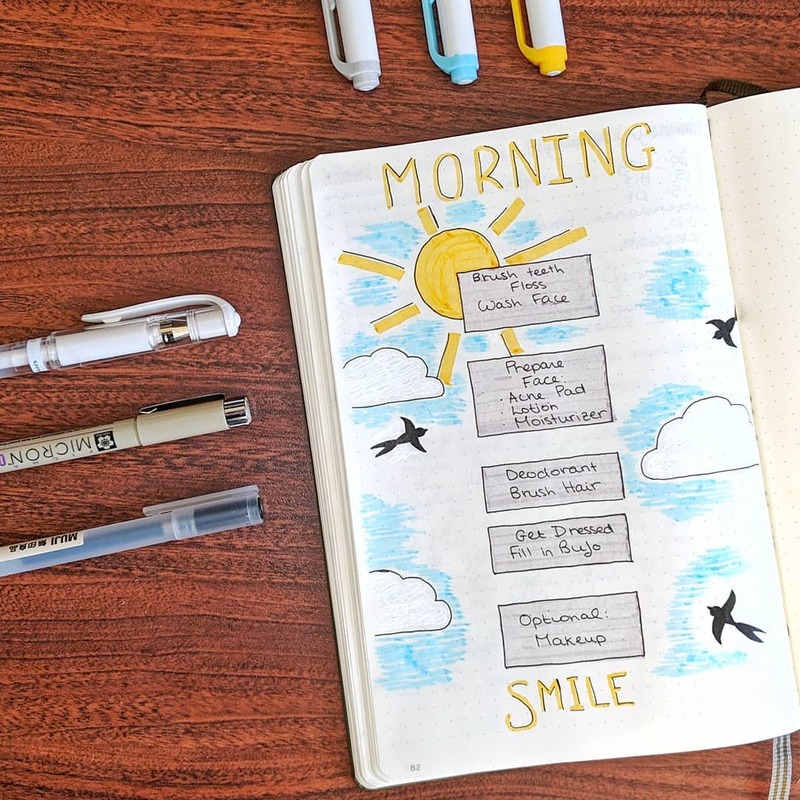 If you’re the type of person who forgets to eat breakfast, this bullet journal won’t let you do that! Just make a mental note to write down whatever it is that you’re eating. If you have a smartwatch and feel like you need to move a little bit more, make your own step tracker. It’ll give you a nice idea of how much you’re moving during the day. 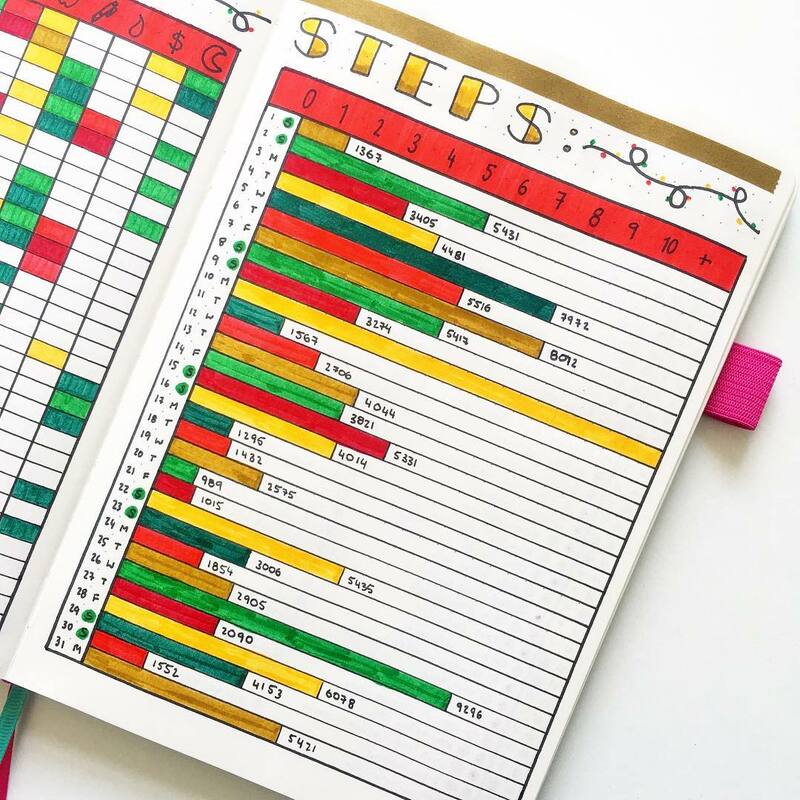 Red columns represent the days when you haven’t reached your step goal, green ones – when you’re just on track and yellow – when you’re super active! Try it, and notice how much fitter you get! If that’s the time of the year when you need a new laptop, a car or perhaps just some money to travel. Start saving and logging what it is that you have saved so far! 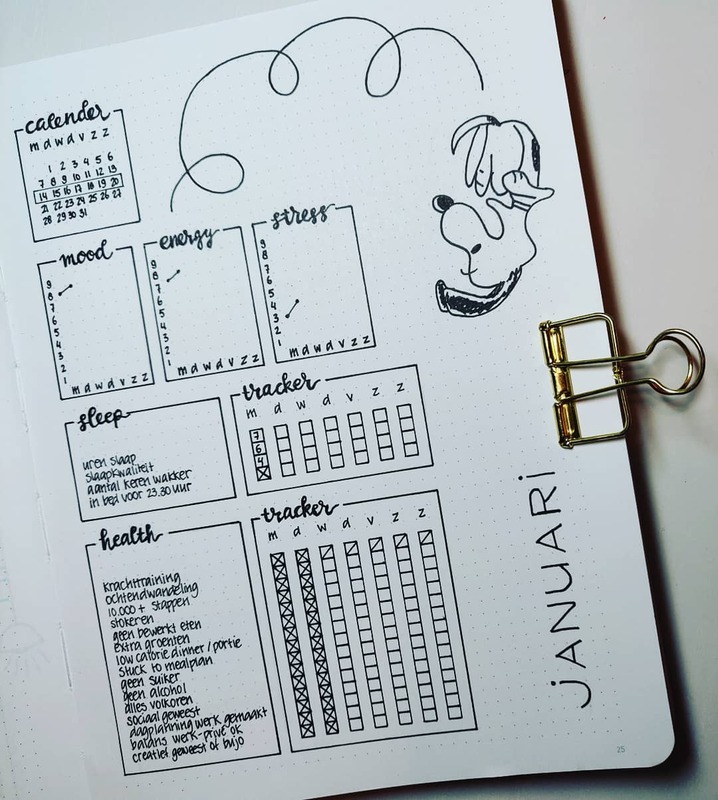 I absolutely loved this bullet journal idea. You can easily track how much money it is that you already have for one thing or another. Try it and start saving today! 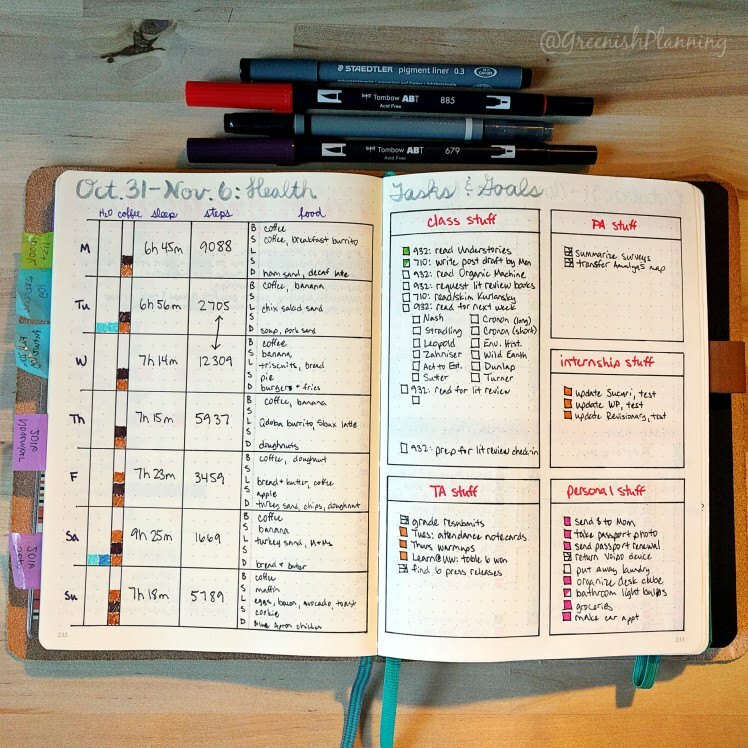 If you have a set of tasks that keep on changing every week, write them down! 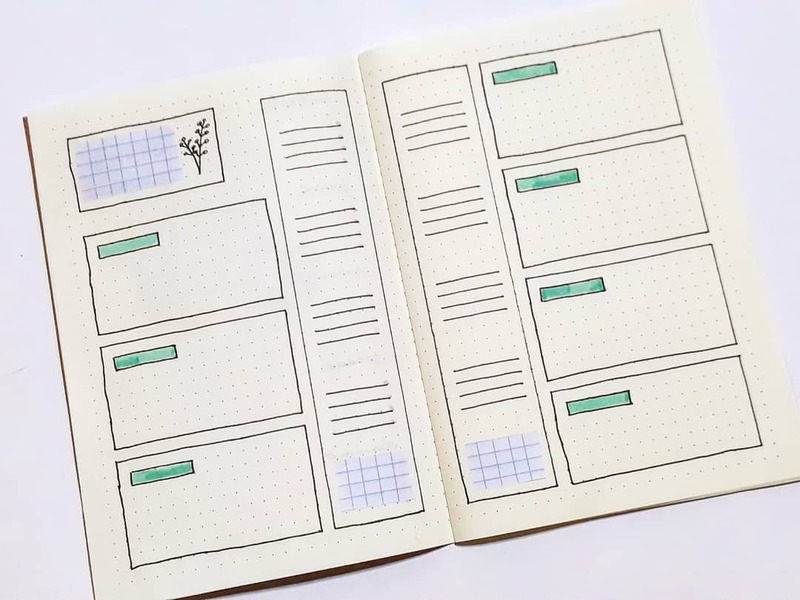 With this bullet journal template, you can easily log what needs to be done this week. Perhaps you have a deadline at school or at work? Or just a party that requires some preparation? Write that all down to make sure you don’t forget it! If you have a new year’s resolution to be more positive and make most out of the upcoming year, you’ll love this little template. 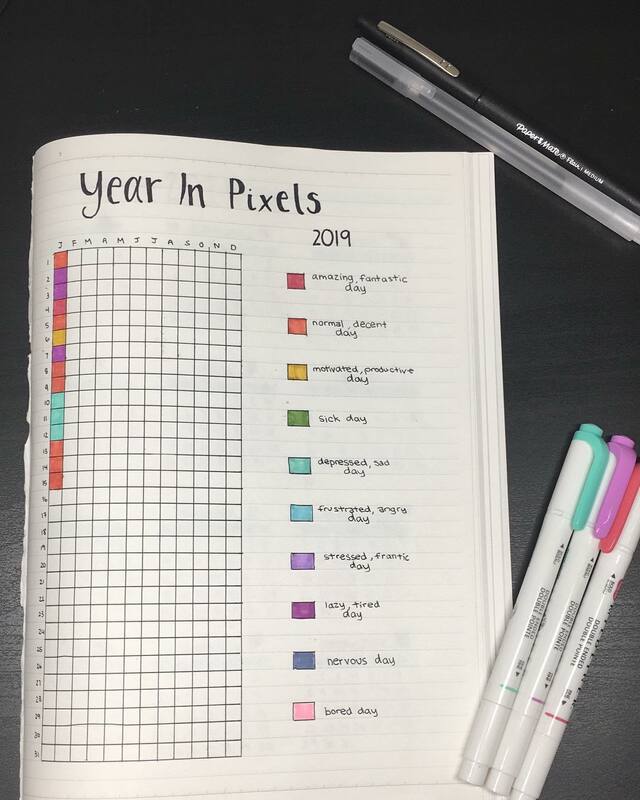 Make sure it has 365 squares and fill them up with a color every day. Choose what colors represent how well your day went. My personal recommendation: keep the positive days warm and bright. Red, orange, pink and yellow are great for that! For less successful days, use blue, dark purple, grey and other colder colors. A year later you can look back and think what you could’ve done differently. 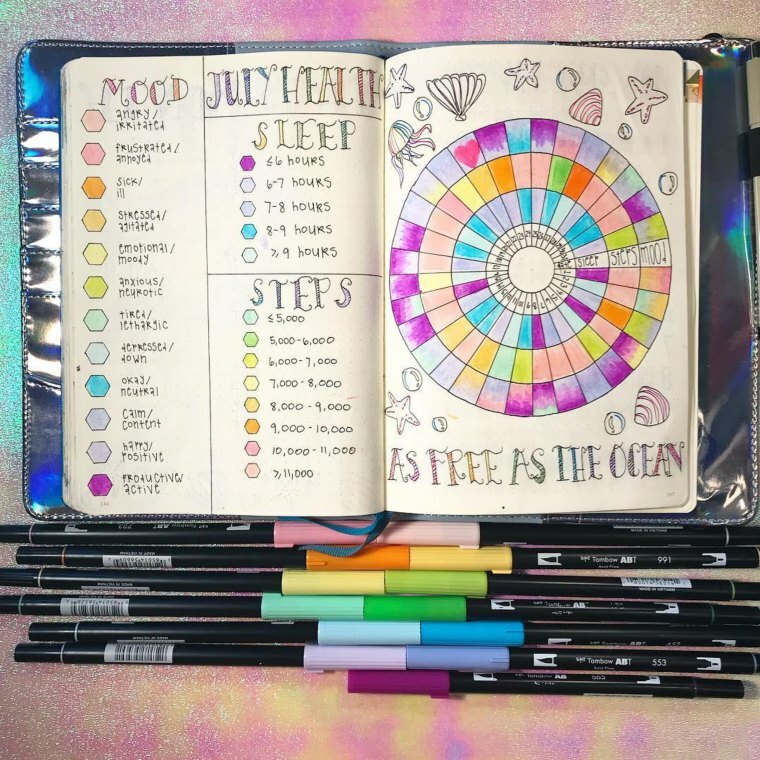 This is bullet journal spread offers a great way to track how physical activity and sleep influences your mood. It’s always great to look back and see whether these factors affect you. It’ll help you to get to know your body a little bit better and perhaps even change your day-to-day life! Often, our stress and anxiousness originate from the things we cannot control. The truth is, since we cannot control them, it means we cannot do anything about them. So, why do we even stress? 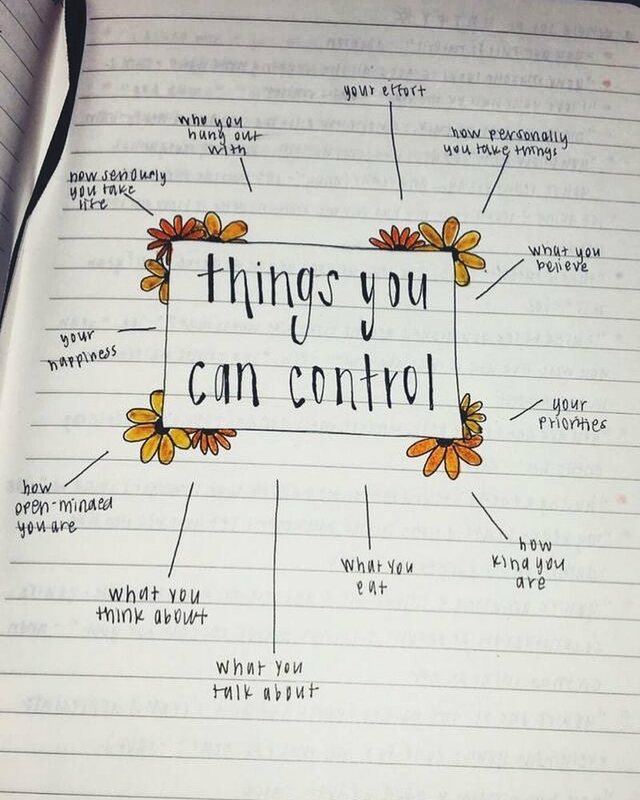 Think of the things you cannot control and the ones you can. Write down what it is that you can control and read them each time you feel anxious about something. 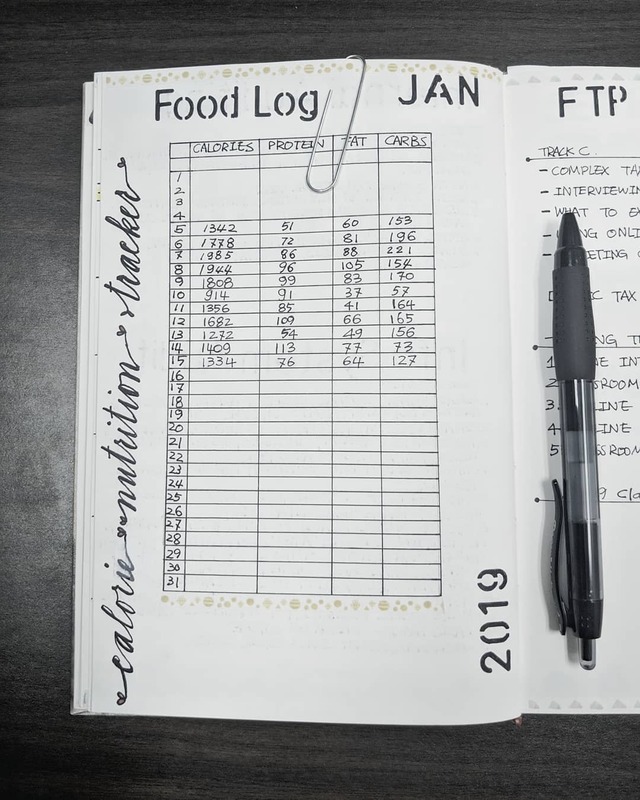 If you’re serious about losing weight and getting in shape, one way to take control of what you eat is to start logging calories, proteins, carbs and fats of the foods you eat. Once you understand how much you eat, you can understand better what it is that you have to eat to lose weight. Ready to eat low carb? Here is 7-day ketogenic diet menu with all the nutritional values! I’ve made it myself, so feel free to check it out! 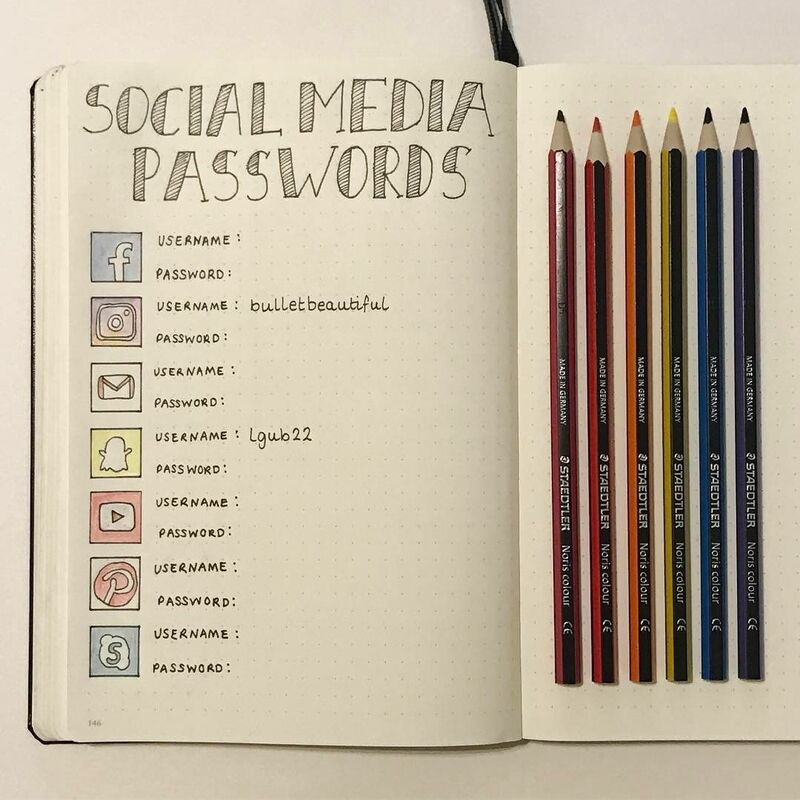 If you’re like me and tend to forget your passwords all the time, write them down. Just make sure your journal is in a safe place and not lying around! It’s great to note down your passwords if you tend to change your devices quite often. Also, it’s just nice to have the important information on paper like in the good old days! I absolutely love this idea. 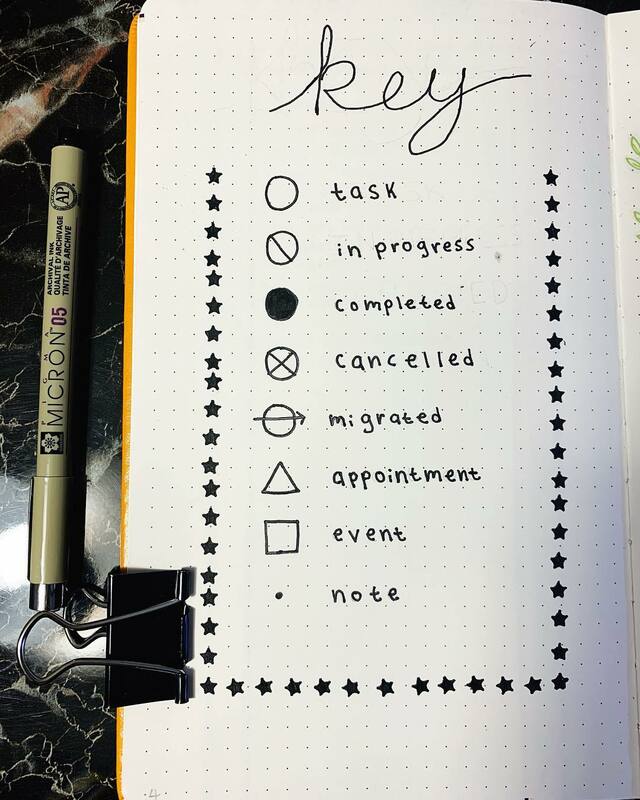 Make your own labels and make sure they’re at the beginning of the journal. Now, whenever you write down a task, you can also label it. Sometimes we have so many things as ‘’work in progress’’ that it might look like we’re actually not doing anything. The truth is – we are! So, use the labels to note that down and save yourself from panicking. 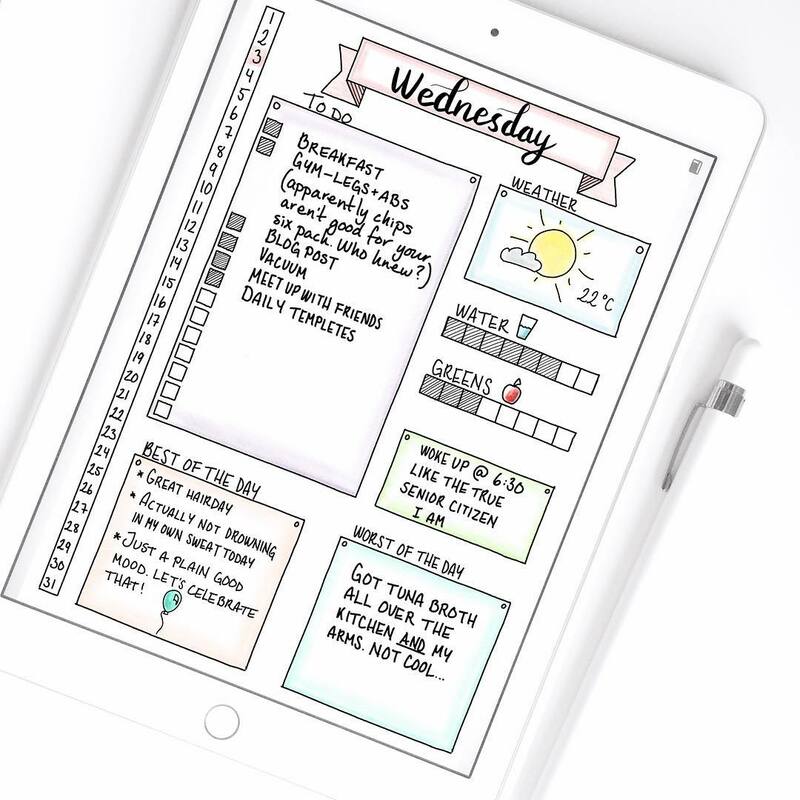 Use this bullet journal template to track how you feel throughout the week. What are your energy levels? Perhaps it has something to do with the way you’re sleeping? An absolutely great idea to see how your body reacts to different things. A great self-care idea for sure! 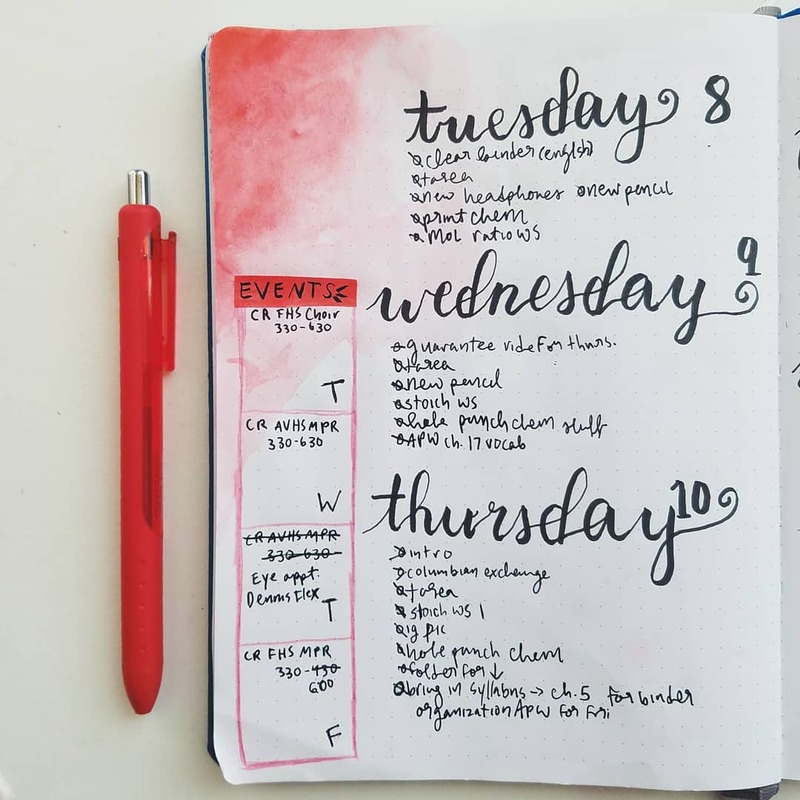 Perhaps if you invest a little bit more time into making a to-do list, you might feel more inclined to start doing the tasks! Have fun with your to-do lists. Make them exciting and enjoy ticking each task off whenever it’s done. What’s more pleasant than that? Starting your morning right can change your whole day. You can always feel more in control of what you’re doing and enjoy the little things that come in the mornings. So, what’s your perfect morning routine? Write it down and follow it every day! Little things like that do add up! We have some of the tasks that simply need to be done every day. So, make sure next time you have an important event coming up note it down in a different column. 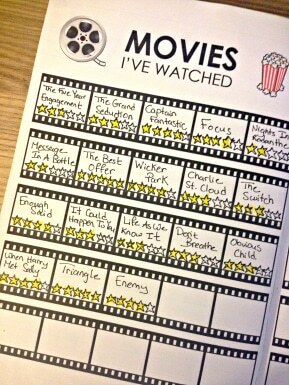 If you’re a movie lover, you’ll love this idea. Start tracking what movies you have watched so far! You can use the little stars to give the movie your own rating. It’s a great list to have for the future reference. If you’re the type of person who loves to re-watch good movies, you can always just come back to this page and pick the movie that’s worth your attention. Not sure what series you’ve already watched? How many seasons? Where you’re at in terms of episodes? 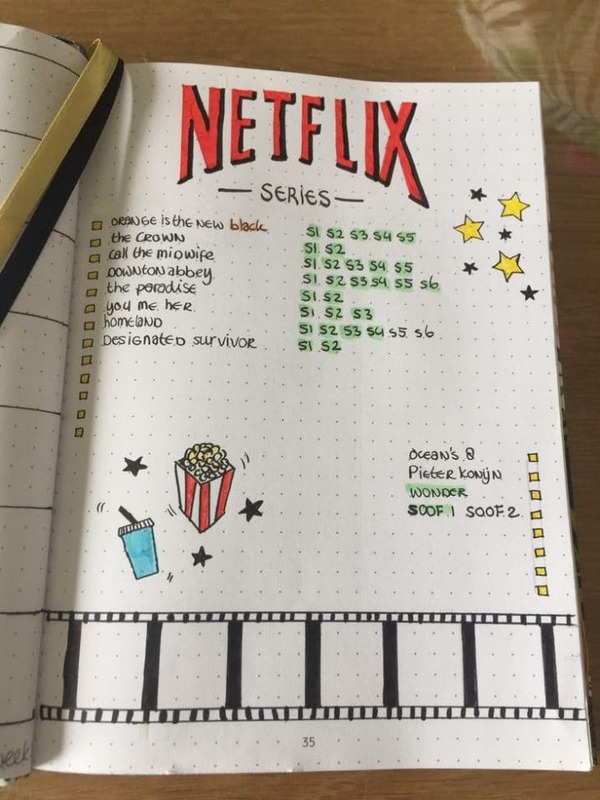 Make your own little Netflix tracking plan. Write down the series you’ve watched, how many seasons you’ve watched, and make sure you note down what else you’d love to see. Also feel free to note down new premieres, so you’re ready to binge-watch your favorite show whenever it’s out! 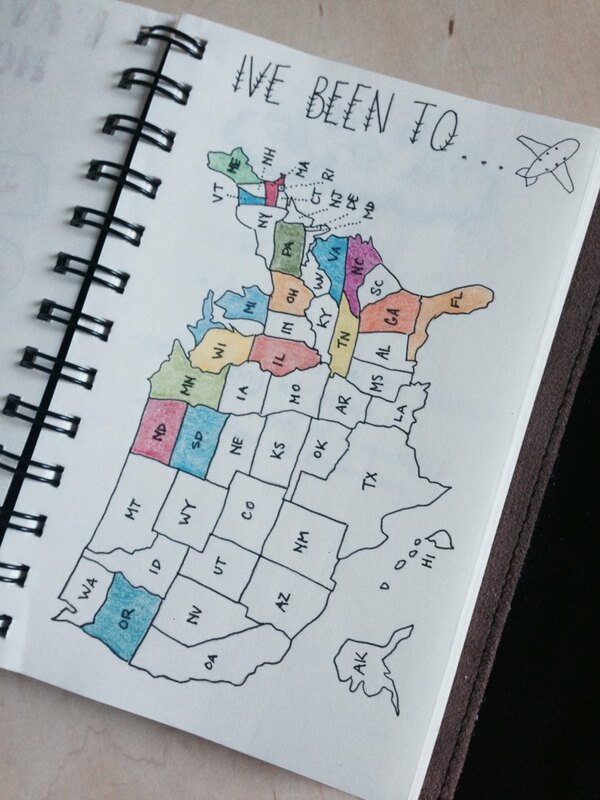 Draw a map and color the countries or states you visit. It’s great for seeing your progress and planning on where to go next. If you have a goal of visiting X states/countries this year, this little bullet journal template is great for that! Try it and share the countries you’ve visited with your friends. This is a great idea for those who want to look back and see how they’ve done. Log how much water you’ve drunk and how much of the greens you’ve had! Also, point out some of your favorite things today. Have you achieved anything? Is there anything you’d love to improve on? Don’t forget to note down the essential tasks too! 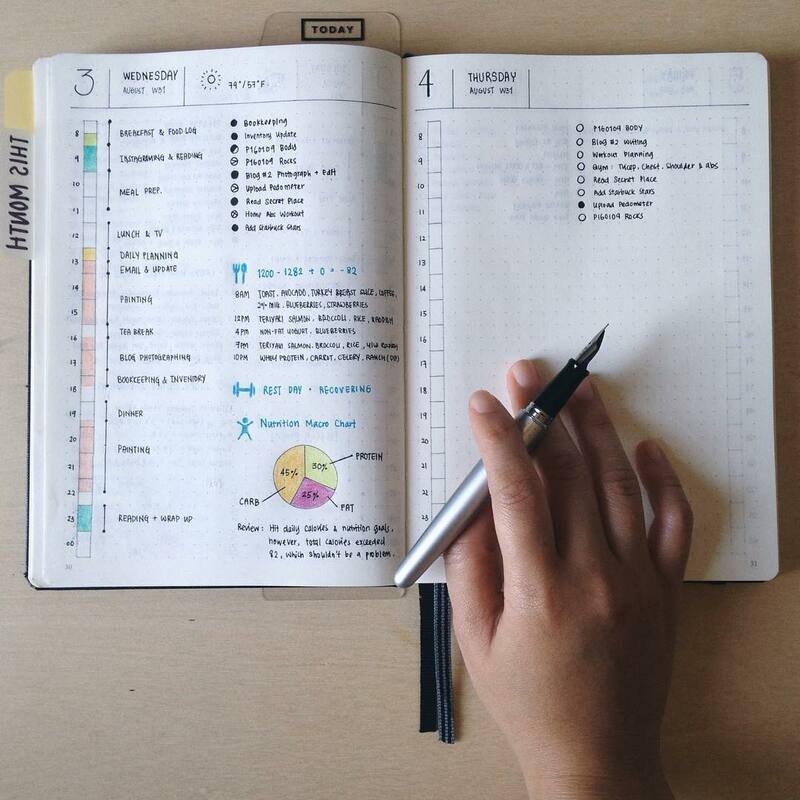 Overall, a great way to track your self-growth and productivity! If you have productivity, fitness and nutrition goals, this little template is great. The best thing about is that you can track your progress. Compare your days and see how much you’re achieving! It’ll also help you to stay in control and keep on beating your fitness goals. 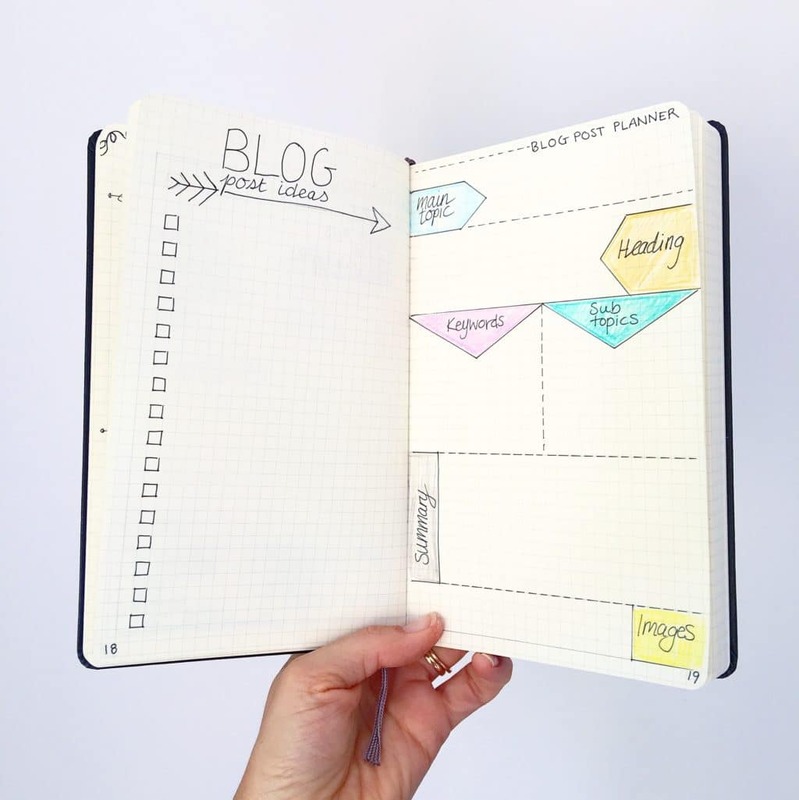 If you own a little blog or planning on starting one, try this blog planner. Choose the topic for the next article, keywords, summary and start writing. 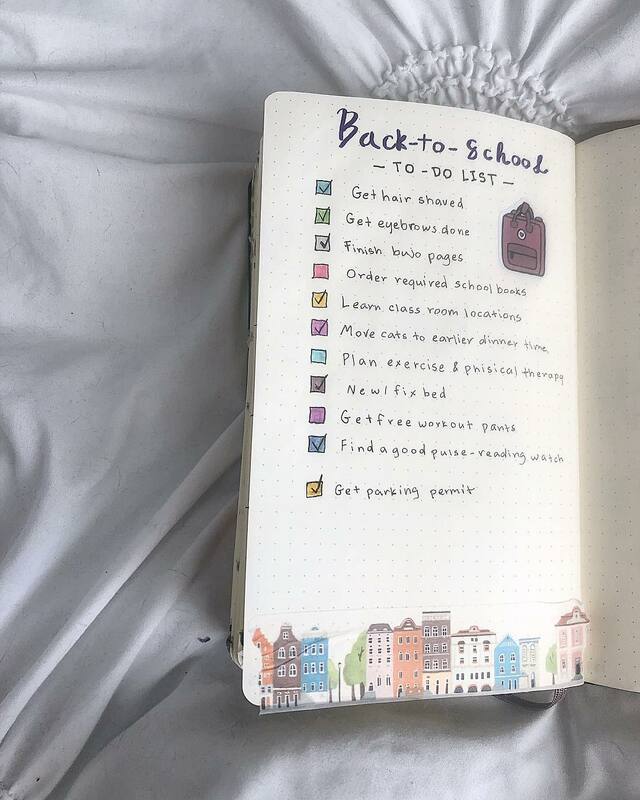 This is a great little planner for someone who has to write an essay for school too! Figuring out what it is that you’re going to write about exactly before doing it is essential! So, try it and let me know how it goes in the comment section. 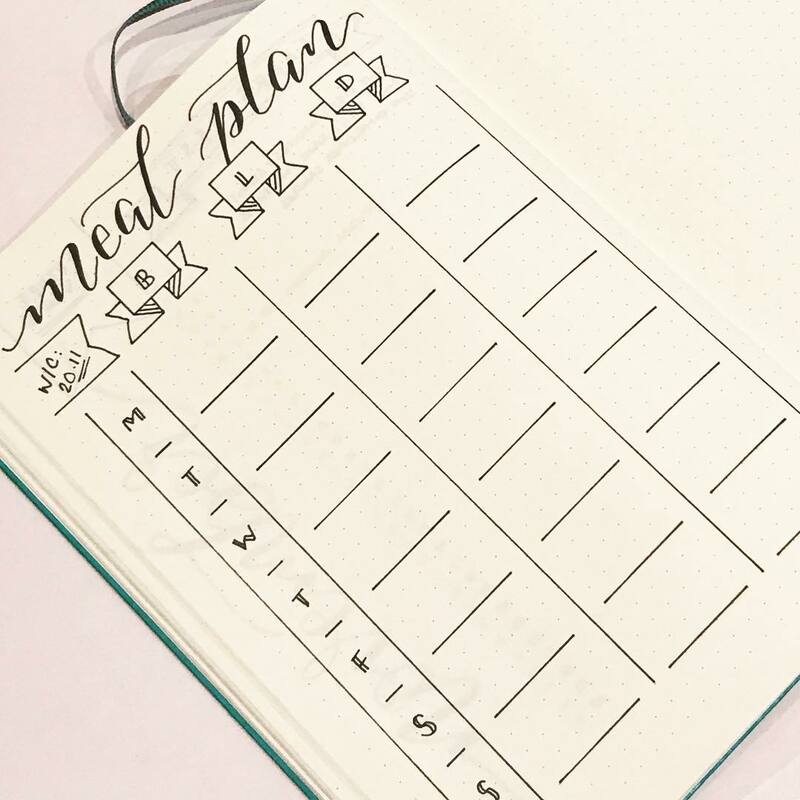 If you’re busy and don’t have a lot of time to cook, making a meal plan for the whole week can save you a ton of time. Especially if you have a big family! Meal prepping or just planning what you’re going to eat for the rest of the week can help you save money too. Also, it’s a great way to make sure you’re eating healthy. If you’re a full-time student or have a full-time job, you know how precious holidays are. 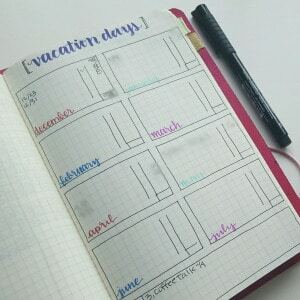 Write down all your vacation days and plan what you’re going to do! Knowing when your next holiday is coming up will help you to get prepared for the trips, buy the essentials and save you from the stress. All to-do lists should have affirmations around them. Simple phrases like ‘’I am strong’’, ‘’I am in control of my time’’ can help you to feel calmer. Let’s be honest, never-ending to-do lists can be scary! So, a little bit of self-affirmation will never hurt. If you’re a student and have a lot of things going on (work, studies, internship, volunteering, etc), make sure you separate the tasks by type. At different times of the month, studies might be more important than at the other. Separate lists will help you to stay in control and do the tasks that are more important at the time first. If you’re a student, often you know about upcoming exams, tests or projects at the beginning of the semester. Make sure you note them down, so you’re always on top of things. Don’t forget to highlight the holidays too! 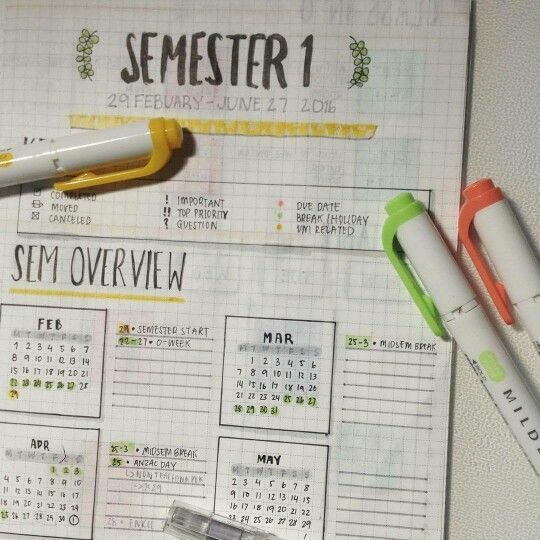 These will keep you motivated to keep on going throughout the semester. 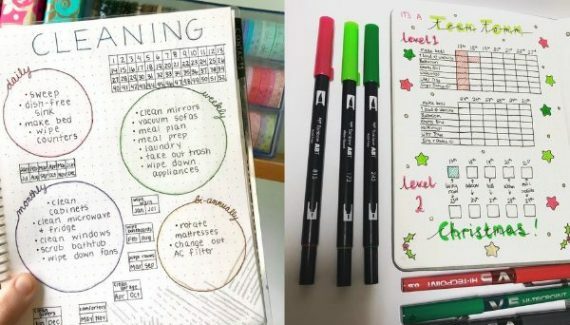 Did you like these bullet journal ideas? Are you going to try any of these? Let me know in the comment section below! Feel free to share your own templates too!